StJohnOnline.ca / CadetsOnline.ca: What's New! StJohnOnline.ca / CadetsOnline.ca » What's New! This is an area where we post important and often useful News Items that we receive from time to time that we wish to share with all of our online members. These News Items are generally not in the form of a subsequent Bunk Mailing and therefore need their own place on our site to be published. We are proud to announce that we are in the final stage of confirming SJA providing the Spectator Medical coverage for the Invictus Games in Toronto; September 23 � 30 2017. The Invictus taskforce is currently in their early planning stages and are looking for keen volunteers that can assist us with the successful planning and deployment for the Games. Please note: due to tight Accreditation restrictions by Invictus, we are looking for the MFR volunteers who are available to commit for the entire duration of the games (7 days). Please email your resume to invictus@on.sja.ca by February 3, 2017. A two-day Casualty Simulation Workshop is being offered for the fee of $150.00. This fee includes a take-home basic Simulation Kit. Food, Travel, Accommodation and Parking are the responsibility of attendee. You are required to bring a casualty with you to the course. Maximum number of participants is 10; it is offered on a first sign up basis. Attendees who are available to assist with Simulation on Saturday March 4, 2017 at your local Zone Competition AND at the Ontario Medical First Response Competition on Saturday May 27, 2017 will be eligible to receive additional supplies to enhance your basic Simulation kit on May 27th,2017, you must be attended both competition dates to receive the additional supplies. Deadline for registration Friday Feb. 3 2017 to Clare Akintoye. We are very excited to announce that RALLY 2017 will be taking place at Everton Scouts Camp in Rockwood on August 5 � 7th, 2017! Please start spreading the word to all your youth members; more details will be available in early spring. Interested in helping out? We are recruiting for sub-committee members! Programming � this team will be responsible for planning all active, passive and group activities as well as select groups for the Rally weekend. Logistics � this team will support the programming committee in material and resources gathering as well as set up and tear down for activities. This team will also assist with dormitory arrangements and supervision. Food & Beverage � this team will be responsible for all menu planning and preparing of meals, snacks and hydration for our active youth members and leaders for the weekend. Media � this team will take all photographs and produce the daily newsletter from the �Rally Pressroom�, slideshows and the video-graphy of our entire weekend at the closing ceremonies. Communications � this team will be responsible for radio communication and track all movement of teams, and time keep for the weekend. A two-day Casualty Simulation Workshop is being offered for the fee of $150.00. This fee includes a take-home basic Simulation Kit. Food, Travel, Accommodation and Parking are the responsibility of attendee. May 27th,2017, you must attend both competition dates to receive the additional supplies. Deadline for registration Friday Jan. 6 2017 to Clare Akintoye. 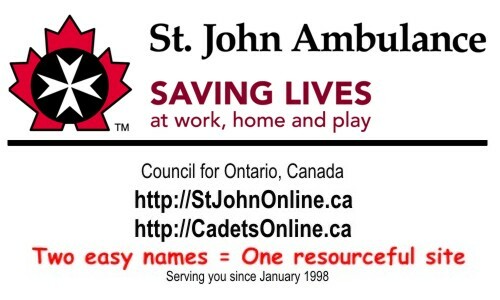 The St. John Ambulance (SJA) Council for Ontario is offering a Non Commissioned Officer (NCO) course for youth members between the ages of 12-17. This informative course introduces youth to the skills required to be leaders in the SJA Youth Program. The course is interactive and presents many opportunities for young leaders to learn from each other while attending sessions from various guest speakers in different areas of programming in the SJA youth program. This course is highly recommended as a prerequiste for all potential and current SJA Youth NCOs. The NCO course will be held at Cold Creek Conservation Area, 14125 11th Concession Nobleton, Ontario. The course will start from 7pm on Friday and end at 4pm on Sunday. As there are only 40 registration spots available, a confirmation letter will be sent to you, so please register early. The cost of the course is $60 and includes accommodation and food for the weekend. Cheques are payable to: �St. John Council for Ontario� with an indication that it is for the NCO Course. Any travel expenses for the weekend will be the responsibility of the participants/branches. Please pack accordingly and review the kit list enclosed.  You (and your Unit participants) will be asked to present/describe the activities & programs and details of your weekly meetings & events. Please come prepared to present for 5-7 minutes. Visual aids or powerpoints are optional. We will have projectors and speakers available in the classroom. Please fill out the Application Form and Medical form and email it directly to nancy.hutchinson@on.sja.ca followed by the mailing of the monies ($60) and original forms to Council for Ontario 15 Toronto Street, Suite 800 Toronto (ON) Canada M5C 2E3 by November 4, 2016 to the attention of Nancy Hutchinson. Thank you and we look forward to seeing you at the camp! We will be hosting the Youth Leadership Course and the Camp Accreditation Course during the same weekend of October 22nd at Cold Creek Conservation Area. As a youth leader, you can only attend 1 of the 2 course offerings. participants/branches, lunch will be provided. resources tab. A hard copy of the manual will be provided to you when you take the course. the camp staff who are certified and in good standing with SJA�s National Camp Accreditation Program. Any youth or adult program activity with camping elements is considered a camp. This includes courses and travel to youth program events like competitions that have camping elements � these must be registered as a camp. Sunday Oct 23), and to show camping history for the past three (3) years in order to maintain or upgrade. There is new course content for the level 2 and 3 candidates to enhance their skills. Additional details and a packing list will be forwarded to you upon your registration. Please fill out the Application Form and return it before the deadline. The National St. John Ambulance (SJA) Youth Leadership Training Program is a course that continuously evolves and is required by all SJA Youth Leaders across Canada. This course is essential for all Youth leaders and SJA Community Services support staff (Volunteer Coordinators, etc.) across Canada that have direct involvement with Youth. Current Youth leaders and support staff are required to have certification in this course. Please note that as this course is a national requirement, failure to attend one of these courses may affect your youth leadership/participation status. New SJA Youth leaders and others that provide direct support to the youth program are required to attend the course within the first year of taking on their position. The St. John Council for Ontario will be holding this course on Saturday August 20th, 2016 at the Belleville Branch office. There is no charge for the course; however there will be a $20 refundable deposit, which will be returned upon your attendance. All travel expenses, accommodations & meals for the weekend will be the responsibility of participants/branches. Please note that there is pre-course readings to be completed and upon your registration and a confirmation email with more details will be sent to you. A copy of the course manual is available on-line for viewing at www.StJohnOnline.ca under the resources tab. A hard copy of the manual will be provided to you when you take the course. Please fill out the application form and return it before the deadline of July 8th, 2016.